This individual Report Prepaid Market Forecasts is available for purchase. This Report is available to members of Mercator Advisory Group’s Prepaid Advisory Service. Please be advised that this Report is normally part of a research and advisory service that provides ongoing support throughout the year. As such, this Report contains significant depth of content that is selected for its strategic importance to our members. (For a description of these services, see our Advisory Services section). 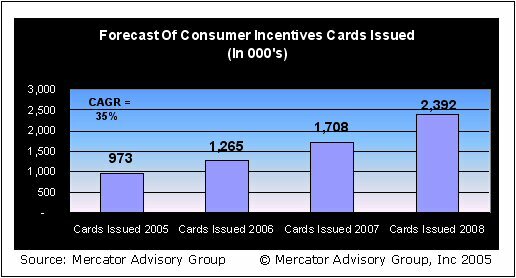 Using data derived from the 2004 and 2005 prepaid market benchmarks that investigated both the Open and Closed prepaid markets, Mercator has produced the prepaid industry's first four year forecast predicting the total spend and the total number of cards issued for market segments identified by Mercator. This report also delivers the first comparison of Open spending versus Closed spending for all relevant prepaid market segments - information critical to anyone planning a prepaid strategy since it identifies markets where Open Cards are gaining market share over Closed Solutions, where Closed Solutions remain dominant, and where the markets are expanding to embrace both solutions. "While the recently released prepaid benchmark reports for Open and Closed solutions document underlying market dynamics, this report converts that information into a four year forecast of Open and Closed spending for all three markets," noted Tim Sloane, Director of Mercator Advisory Group's Debit Advisory Practice. "This forecast offers the industry its first consolidated view of the industry measuring Open cards, Closed Cards and other closed systems that include Transit, Telecommunications, Digital Media and even Utilities." Also included in this report is a total spend for each category in one consolidated table. This enables readers to extract growth rates for each sector and for the total market from Open and Closed systems. The report contains 24 pages and 33 Exhibits.